And Giving Away a $250 Best Buy Gift Card! Long time no garden blogging. I'm not really sure where November went, but I do have photographic evidence that exciting progress was made in the garden. The bed for the garlic was nicely amended, the garlic was planted (actually that was done back in October—on time! 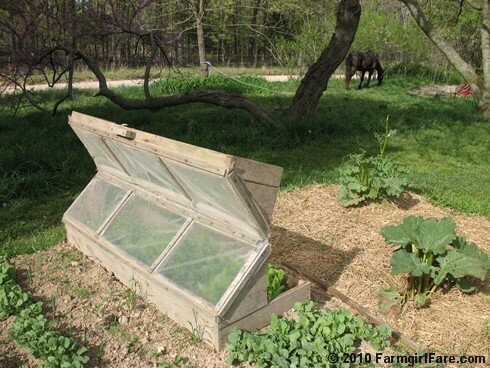 ), the garlic bed was mulched, and I even managed to score a new raised bed in the process (not the one pictured above). Is your garden still giving you treats? Want to see more spooky stuff? 11/8/05: Did the Goblins Get Them? 10/31/09: Don't Let the Goblins—or this Little Brown Bat—Get You! 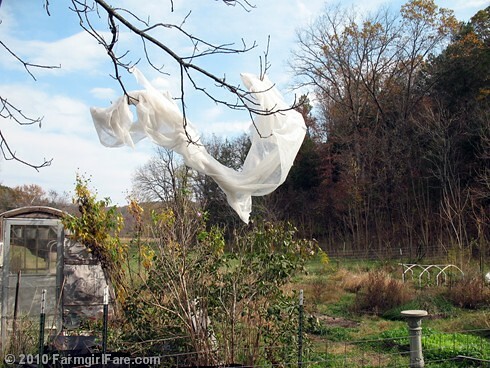 © 2010 FarmgirlFare.com, the frightening foodie farm blog where a couple of very blustery days ago, this piece of floating row cover actually flew up into that tree and the garden decorated itself. I thought it was perfect—until I realized I was probably going to tear the row cover into pieces while wrestling it back to the ground (it was really tangled up in the branches!). 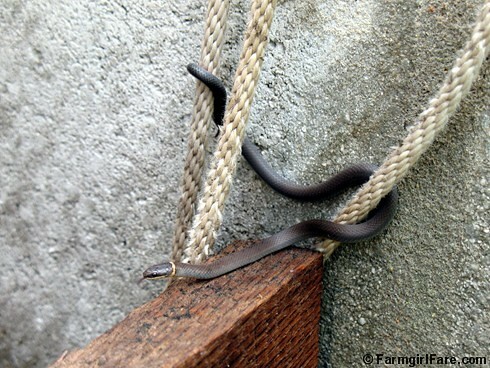 Fortunately my hunky farmguy rescued it while I wasn't looking—or maybe it was the goblins. Do you have goblins living in your garden? 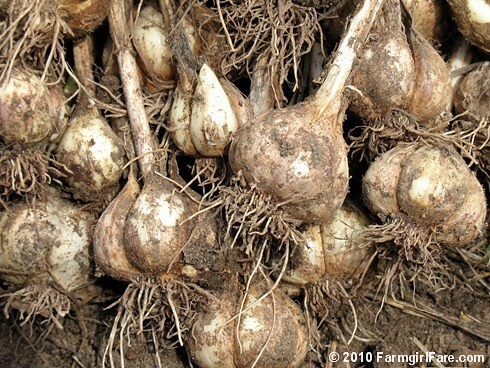 Garden Journal 10-22-10: It's Time to Plant Garlic! I can't believe I might actually get my garlic planted on time this year. When is the best time to plant garlic? There's no one right answer to that question, but in many areas it's October. 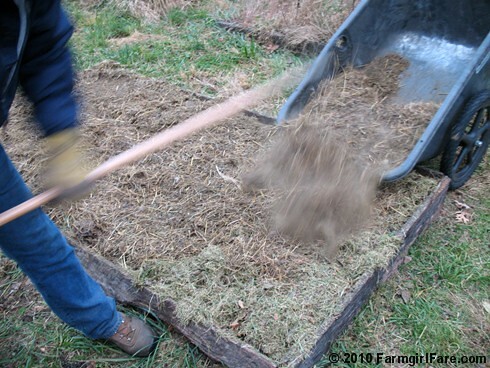 If you live somewhere that has a real winter (as opposed to places like California and Texas and Florida), this gives the cloves enough time to sprout and get a good head start growing before the ground freezes and they go into hibernation mode. If you live where the winters are mild, you can get away with planting your garlic later. If you're minding the moonsigns (you can read more about how that works here), you'll want to plant your garlic on a fertile day in the third quarter, which promotes underground growth, because the waning moon is pulling things 'down.' This is also a good time to plant other root vegetables, like potatoes, turnips, carrots, parsnips, rutabagas, and beets, though not onions. While you're waiting for your green tomatoes to ripen—or if you have a lot of immature ones, which probably won't ripen—you could turn some of them into my no sugar, so easy, salsa-like green tomato relish, which is one of my most popular recipes. Will green tomatoes get ripe and turn red after picking them (or yellow or orange, depending on the variety)? Yes. Is it difficult to get tomatoes to ripen off the vine? No. Do you have to pull up the whole tomato plant and bring it inside? No. 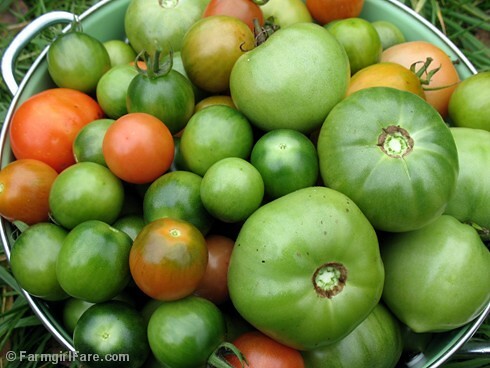 Do you have to do anything special to get green tomatoes to ripen? No. Do they have to be kept at a specific and/or steady temperature? No. 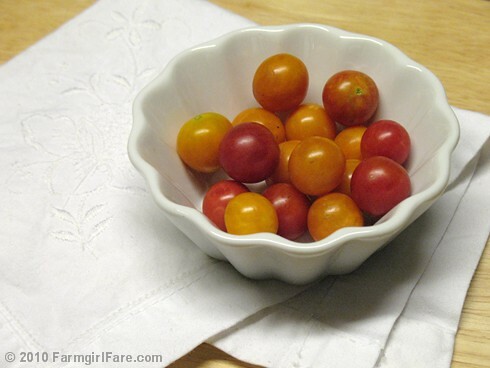 Will tomatoes ripened indoors taste as good as vine-ripened garden tomatoes? Probably not, but any homegrown tomatoes are going to taste better than no homegrown tomatoes—especially if you're enjoying them on Thanksgiving or Christmas. And they'll still probably taste better than storebought tomatoes, especially if you're buying them at Christmas. I literally cannot remember life before my kitchen scale. I often use it several times a day. 1. Go to three different places and buy a bunch of Swiss chard or kale—or even parsley or cilantro—at each one. Are they anywhere near the same size? Didn't think so. 2. 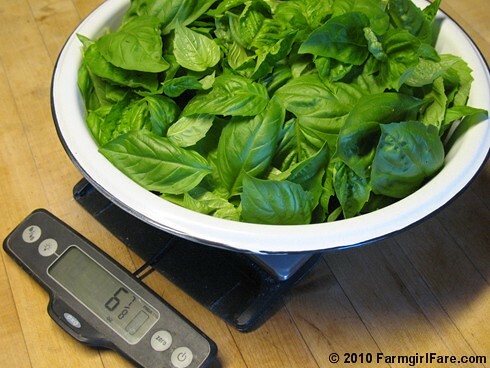 Ask three people to measure out two cups of basil leaves for you, then lay the piles side by side and compare them. Another interesting experiment, though it isn't relevant to my yes, you really do need a kitchen scale argument, is to buy a lemon at three different places and compare the sizes. Zest and juice them if you want, too. Yeah, whoa. Huge difference probably, huh? And how many recipes simply call for 'the zest of one lemon,' or 'the juice of one lemon?' That kind of drives me nuts. But back to the scale. Once you have one in your kitchen, it's amazing how many things you'll probably find yourself weighing while cooking and baking. They're also are great for weighing postage, especially since you need to know the weight of a package if you want to print out a mailing label online and avoid waiting in line at the post office. 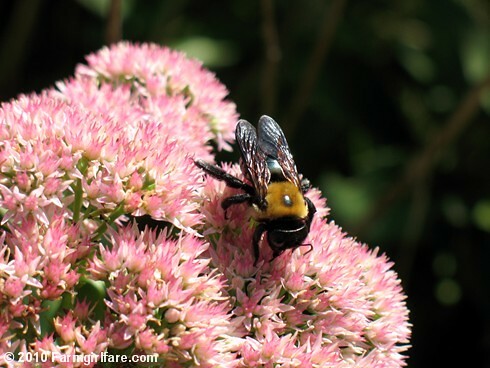 The bumblebees and I both love sedum autumn joy, which darkens in color as the season progresses. Okay, so it's probably going to take me months, rather than weeks, to get through that ambitious list I recently shared of upcoming blog post topics. But you knew that already, didn't you? I don't think the little thrill over seeing tiny seeds sprout up out of the soil will ever go away. At least I hope it won't. I've grown a lot of fall vegetables over the years that I've completely forgotten about. Thank goodness I did remember to take pictures of them—or at least of some of them. Okay, so summer is finally winding down, and gardeners everywhere are busy packing away their garden tools, preparing their beds for winter, and already thinking about next spring. If it's been a good year in your garden, you're also hopefully still picking delicious, vine-ripened bounty. 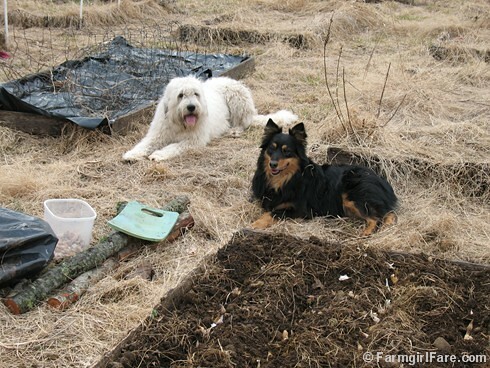 But what you should also be doing is starting a few fall crops. And this isn't as daunting—or exhausting—as it sounds. My favorite kind of garden pest: cute, cuddly, and prefers meat over vegetables. I started tweeting but forgot to tell you. Since I'm always behind replying to e-mail and comments (thanks for your patience! ), not to mention garden blogging in general, tweeting isn't such a good idea for me. But for the last several months I've been announcing each new blog post on Twitter—mostly on time, though sometimes I still forget to do it. You'll find In My Kitchen Garden on Twitter here, and Farmgirl Fare here. 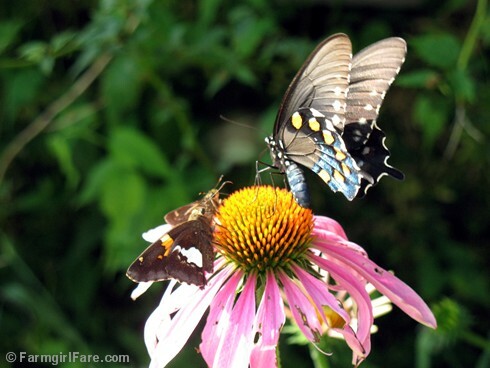 This summer has seen record number of In My Kitchen Garden visitors (welcome, new readers! ), and I couldn't be happier. It seems gardens—and gardeners—are sprouting up everywhere, and about 20,000 inquisitive growers are finding their way here each month. 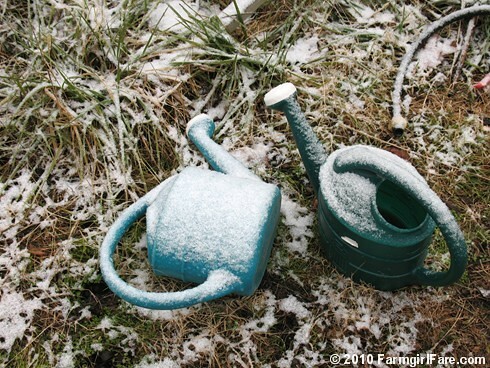 Between that and our recent slight drop in temperatures (at last) I'm so inspired, both in the garden and on this garden blog. Garden Journal 8/18/10: Tomato Season Has Arrived and the First Harvest is In! Yep, that's it. Pretty though, isn't it? One of the nicest things about gardening is that the littlest surprises can often mean so very much. A month or so ago, I changed my blog header to a photo that more accurately reflects the season: tomatoes! But ever since then I've felt like a guilty impostor. Oh, those are my tomatoes up there alright—I just picked them back in 2008 (at the end of October!). And while pretty much everyone equates the summer vegetable garden with ripe tomatoes, I don't actually have any growing in my garden this year. Or so I thought. It's a lot easier to write off a garden disaster as a learning experience when it doesn't involve your entire crop. 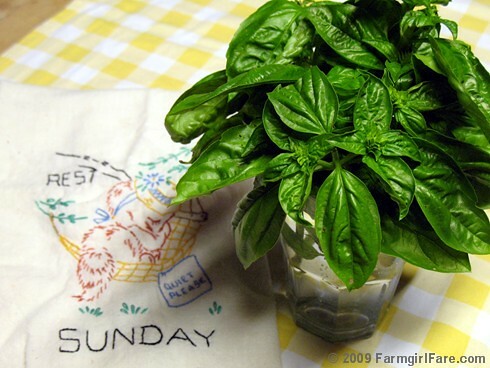 The photo above illustrates one of the best ways to store fresh basil: in a fragrant little kitchen tabletop bouquet. Sweet looking, nice smelling, and obviously some very happy fresh cut herbs. That's how I did things last year, when I had so much green and purple basil growing in the garden it kept bursting into bloom faster than I could use it up. This year I had a learning experience—with my one measly plant, which is why this post isn't called something chirpy like Hip Hip Hooray! It's Pesto Time Again! as was originally intended before the harvest. I'm a lot more excited about growing garlic after digging up this year's crop. I'm doing a little back dating here, so that the garden journal date above accurately reflects the day I actually harvested my garlic, as opposed to the day—two weeks later—I'm finally getting around to writing about it. It would only be cheating if it were the other way around, right? Last year I promised myself I would never again plant my garlic in February, which is about four or five months later than it should go into the ground here in southern Missouri. And this year I kept that promise—I planted my garlic in March instead. It's time for a new game plan. Actually more like an extended half-time period but without all the outrageous festivities. Back in early spring, I was doing an energy work session over the phone with a friend of mine, and as I started listing all the things I was so behind with—including my totally neglected garden—she said, "What would happen if you didn't have a garden this year?" The thought was so inconceivable I literally had no response. But now I know. Life goes on—just with fewer vegetables. 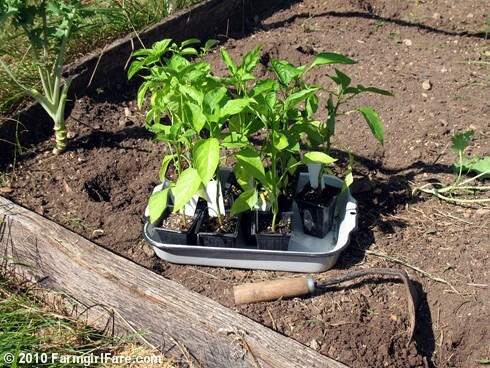 The most important thing you need to do in the garden is get your seeds and plants in the ground. Otherwise nothing else matters. As obvious as it sounds, it's amazing how often I forget this simple fact, missing out on growing so many things each year because I'm focusing too much on all the prep work I need/want to do and not enough on the actual planting. Lettuce season in southern Missouri has come and gone, yet despite always telling people how easy it is to grow lettuce from seed, I don't have a single leaf to show for it this spring—and you know how much I love lettuce. Your seedlings don't care if the soil isn't perfectly amended, or the pathways around your raised beds are full of weeds, or it's not the absolute ideal day for transplanting according to the lunar calendar. They just want to be put in the ground. And yesterday morning—after worming 30 lambs and before it got quite all the way up to the 103 degree heat index predicted for the day—some of the poor suffering seedlings I bought over a month ago finally were. There's a winged frenzy going on out in my flowerbed. 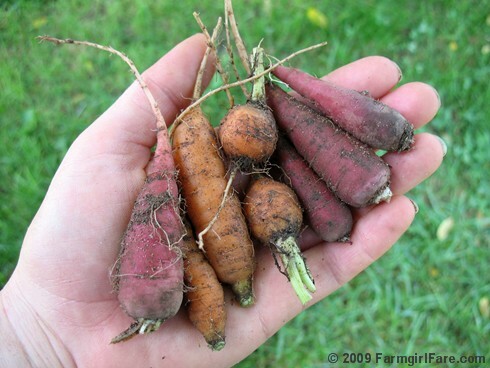 I never shared the final results of last year's carrot growing adventures (which I wrote about here and here)—mostly because they were so disappointing. The short version (because I'll probably never get around to posting the long version) is I've decided that, for me, growing carrots from seed isn't worth the effort—at least right now. I did learn a lot about growing them, though. Newly sprouted Greek oregano is always a welcome spring sight. 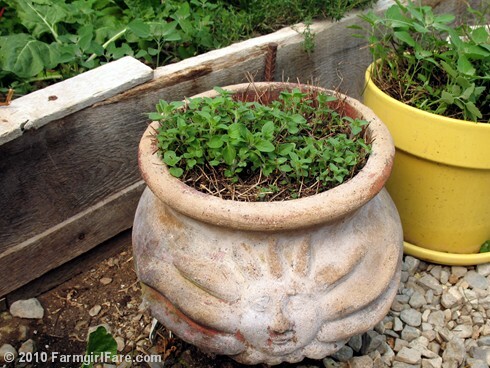 It's time to move this sun loving herb out of the greenhouse and back onto its cement pedestal in the garden where it lives most of the year. Even before I was much of an herb eater, I grew my own—and dreamed of planting a gorgeous, formal herb garden (a dream that still sort of lives but will probably never see the sun). I don't know why, but there's just something about the words herb garden. Romantic, maybe? 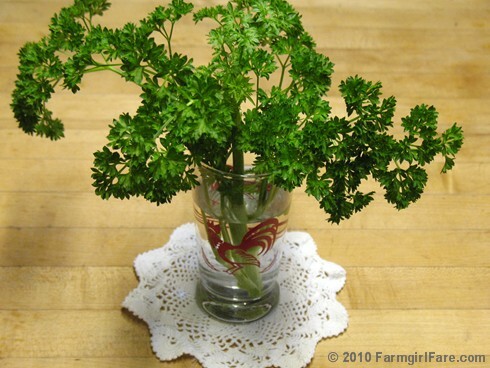 I do know that the first thing many beginning gardeners grow is herbs. Audrey's twins, ten days old. 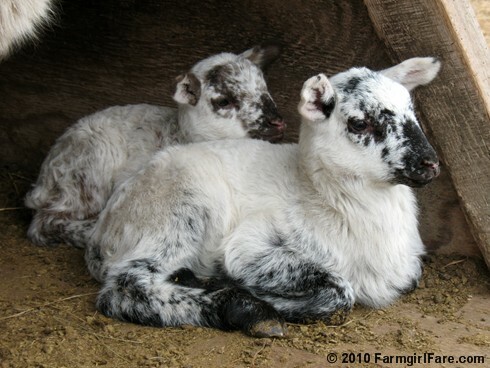 This is what's keeping me from the garden—all the cuteness down at the sheep barn! I haven't put anything into the ground yet, including the $39 worth of mail-ordered onion and leek plants that arrived a week and a half ago. Lambing season is in full swing here on the farm, with two sets of twins and a big spotted girl arriving in just the past two days. All planting woes aside, the good news is that, besides being surrounded by adorable bouncing babies, I'm building up my organic fertilizer empire! 1015Y Texas SuperSweet onions harvested last June. Despite numerous failures and disappointments in the garden over the years, when it comes to buying seeds and plants I'm still a consummate optimist. I also have no self control. This can be a dangerous combination—and pricey, too. Last spring was the first time I grew onions from purchased plants rather than onion sets, and despite the fact that many of them bloomed way too early (which means I ended up with some fairly small onions) I enjoyed some delicious success—and still ended up with bigger onions than I've ever grown from sets. (The flowering was most likely due to some wet and wacky spring weather, and I'm hoping to cover this problem in a future post). I wrote a little about last year's onion growing here and here. For experiment's sake, in late February of 2009 I ordered a total of 10 bunches (approximately 60 plants per bunch) of 9 different varieties of onions (along with hundreds of leek plants—which was a whole other growing adventure I've been meaning to write about) from Dixondale Farms in Texas, the oldest and largest onion farm in the U.S. I'm running a little later with my ordering and planting this year, but according to Dixondale's shipping schedule, March 9th was their suggested ship date for my area. I also ordered fewer plants and fewer varieties, sticking to the ones that did the best for me last year. I love these crunchy little things. I can't let another year go by without telling you about my new favorite cucumbers—and for once I'm actually telling you about something in plenty of time to plant! If I had to choose between growing lemon cucumbers (which I wrote about here) and these mini white cucumbers, it wouldn't be an easy decision. What are the advantages to growing this open pollinated variety (which is really more very pale green than white)? First of all, just like with cherry tomatoes, smaller cucumbers mature more quickly than their larger counterparts—49 days versus an average of 55 to 72 days. They can be picked and eaten when they're even smaller than the ones in this photo (and I don't have very big hands). It's a weekend for dreaming and scheming. Friday's six-inch snowfall has us happily cozying up indoors—except for the three to four hours a day tending to the donkeys, sheep, chickens, dogs, and outside cats. But I don't mind doing chores even in the snow, especially when it's sunny and warm like today. (Does thinking 30 degrees is warm mean that I've officially crossed over?) It really is beautiful out there. Now that I've lived on a farm for 15 years, I start to go a little stir crazy if I don't get outside every couple of hours. What's nice is that no matter what the weather, there's always some good reason to leave the kitchen or computer and head out into the fresh air, even if it's only for five minutes to empty the kitchen compost container, feed some scraps to the chickens, or just hug a sheep. I'll admit that a little laziness does kick in when everything is covered with snow, and I'm perfectly content to stay out of the the garden for a day or two. I certainly don't stop thinking about it, though. This is the time of year when the garden in my mind and the garden in my reality have so much in common. With no blister beetles or other annoying bugs, no weeds taking over, no ravenous rabbits and deer, no crop failures, no dog damage, no seeds that never sprouted, no seedlings that should have been put in the ground weeks (or months!) ago, no work that can really be done (though I'm sure I could come up with something if I tried), and all those big plans to harvest the most glorious bounty ever, it's definitely one of my favorite times of year in the garden—until I get hungry of course. Is there anything going on in your garden right now—or is it all still happening in your head? © Copyright 2010 FarmgirlFare.com, the snowbound foodie farm blog where one thing I do miss in the garden this time of year—besides all that fabulous food—is seeing all the butterflies fluttering about. Time for all those empty envelopes and really outdated seeds to go! I actually took this photo back in January of 2007, but looking at it three years later still evokes a warm and fuzzy feeling of accomplishment. What a mess my seeds were! I'd been hoarding dozens of empty paper packets with the misguided idea that somedoay I would reuse them. I'd also been letting my stash of really outdated seeds just keep accumulating, telling myself each year that you never know, they might actually still be good—and what gardener can simply toss out good seeds? But did I ever bother to do some simple testing for germination? Of course not—all the fresh new seeds had always just arrived! Anyway, in a rare fit of mid-winter organization and decluttering three years ago, I spent a couple of hours sorting through my entire garden seed collection—and got rid of nearly all of it, including everything you see in the photo above (except the cute little storage containers). It really did feel great. Of course I still couldn't stand the thought of dozens of packets of seeds going to waste, so I stuffed them into a brown paper bag, wrote 'FREE GARDEN SEEDS' on the outside in big letters, and casually dropped it next to the magazine free pile in the entryway of the library the next time I stopped by to return some books. When I walked back through five minutes later, the bag was already gone. It was the highlight of my month. According to Martha's Calendar in the front of the January issue of Martha Stewart Living magazine (which can sometimes be helpful but usually makes me feel like an underachieving slug), somebody in Marthaland will be sowing cool-season crops, 'such as cabbage and broccoli,' in the greenhouse today. According to my handy dandy new Gardening by the Moon 2010 wall calendar (that I received as a review copy from the publisher, and which is already proving helpful—there's even a PDF downloadable version available), I have until tomorrow or Thursday, when the second quarter moon is in Cancer, before I need to be thinking about planting above ground annuals. No matter what, I obviously need to get cracking, especially since I'm determined to successfully grow brussels sprouts from seed this year (to feed my Quick Roasted Brussels Sprouts with Lemon and Parmesan addiction), and they take forever to mature. Did I mention I haven't ordered any seeds yet either? Though I do have at least one 2009 packet of brussels sprouts seeds (along with dozens of other varieties) kicking around here someplace. 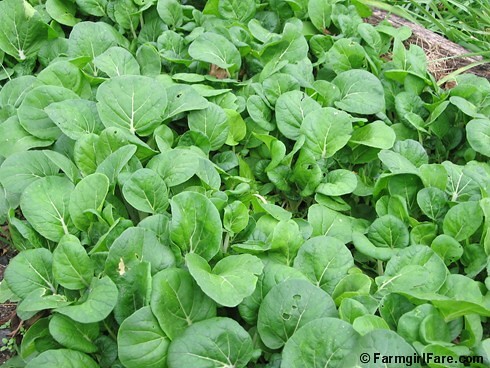 I also want to direct seed some arugula, mache (a cold loving little green also known as corn salad), and lettuce in the unheated greenhouse to see if they'll sprout this early. My excuse for not yet ordering seeds is that I need to take stock of what I already have first, and my seed collection isn't quite as organized as it was after the above-mentioned 2007 purging. Time to hurry up and take on the task, though, since before I know it, it'll be time to start all the warm weather seeds—and I can tell you from personal 2009 experience that if you live in southern Missouri, putting your tomato plants in the ground in mid-July (or even in June) is really not a good idea. As far as storing and organizing my seeds, I have yet to come up with a surefire system that works best for me. I used to put seeds I save myself in plastic vitamin containers (there are a few in the photo above) rather than paper envelopes since they're airtight, but they take up a lot of space and don't stack well, so now I use itty bitty zipper bags that I buy for a couple of dollars per hundred from a vendor at a nearby antique/junk mall. I like the little purple snapping lid containers pictured above for separating seeds by type, but lately I've found myself just using quart and gallon zipper freezer bags instead. One of the best places to store garden seeds is actually in an airtight container in the refrigerator (the freezer is good, too), so these bags take up much less space than the boxes. Now all I have to do is actually put the bags of seeds in the fridge. So how do you organize and store your garden seeds? I'm sure some of you have figured out much better ways than I have! 7/1/07: How to Grow Your Own Gourmet Lettuce from Seed—It's Easier than You Think! © 2010 FarmgirlFare.com, the can't bloom until you're planted foodie farm blog where starting containers of seeds is one of my favorite parts of gardening, but putting together the related links above, it quickly became clear that the farm cats get a lot more use out of my potting bench than I do. And I haven't forgotten about posting my list of new year's garden resolutions, although there's no big rush since I can't yet check anything off it. Happy New Year! Between the bitter cold (it was minus six without the windchill yesterday morning) and this month-long flu I'm finally getting over, it's been a slow start to the new year, both in and out of the garden. But despite the snow, Sylvester, who spends much of his time in the garden and greenhouse, is ready and willing to get in the way lend a paw whenever I step outside. I did make a New Year's Day list of hopes and resolutions for my 2010 garden, which I'll be sharing in my next post (and asking about yours!). 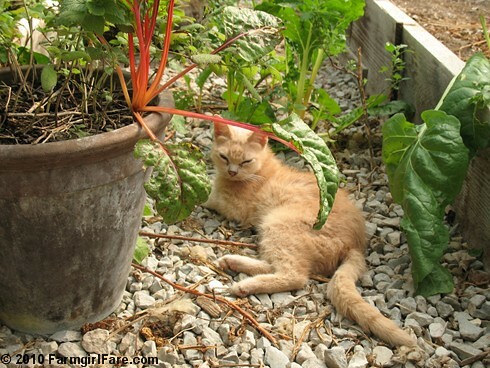 In the meantime, are there any four-footers who keep you company in the garden? If you've shared photos of them on your own blog, you're welcome to include a link in your comment. Want to see more of Sylvester? © Copyright 2010 FarmgirlFare.com, the never alone foodie farm blog where I may rant and rave about the destruction caused by various critters in the garden, but I really wouldn't trade their companionship for anything—well, except a beautiful 8-foot high stone wall around the entire garden, which would also keep me from having to deal with the dreaded deer.